William George Jewsbury | An assessment of whether or economic growth through urbanisation is comparible with sustainable development cities and development. One hundred years ago, only 14% of humanity lived in cities, this figure increased by 33% upon entering the new millennium (Whitehouse, 2005). During the final months of 2008, United Nation’s estimates claimed that over half of the world’s population now live in urban areas, with a significant increase in cities of plus 1 million inhabitants around the globe (Charbonneau, 2008). Indeed, during the 1950s, there were 83 cities with populations over 1 million people, by the year 2000 this figure had risen to 411, indicating an almost five fold increase during a 50 year period (Whitehouse, 2005). Hania Ziotnik, the head of the UN Population Division, declared that these changes are indicative of great ‘economic dynamism’ and growth, which enables the advancement of humanity, whilst simultaneously challenging the sustainability of cities (Charbonneau, 2008). However, such economic growth is notably an ‘assumed’ outcome of urbanisation, and is not mutually constitutive of progress in all areas of human civilisation (Blowers and Pain, 1999). As Ziotnik hinted, without structured economic and urban growth, the sustainability of the ever expanding city is thrown into question in several ways. First, the environmental dimension of urbanisation asks if the rapidly increasingly populace of cities threatens to degrade the atmosphere (through pollution) and a depletion of natural resources. Second, do societal changes and economic disparities within cities enhance an unsustainable pattern of consumption? Third, can sustainable development help ameliorate the identifiable environmental and social disorders of economic growth? In other words, are the current levels of economic and urban growth sustainable within cities, or are new forms of governance required to facilitate a sustainable progress? In this essay, a brief evaluation of these questions, backed by quantitative data, will provide insight into the sustainability of current economic and urban growth trends. Cities characterised by their intensity, and through the extent of their interconnection, are made of multitudinous networks of economic, cultural, and fiscal relations (Massey, 1999). These same characteristics are also responsible for the intensification of social and environmental impacts, with the very existence of the city leaving a lasting ‘ecological footprint’ on the earth’s surface (Blowers and Pain, 1999) Indeed, large cities, as ‘geographical plexus’ of far reaching interactional networks, can aptly be embodied as living, breathing, organisms which both produce and consume. It is in this metaphorical sense that Jopling and Girarder (1996) suggest the city of London as possessing a ‘metabolism’. With this view, one can statistically assess the city as a series of sustaining inputs and pollutant outputs, thus helping denote any environmental impact. London, a city of 7.01 million inhabitants in 1996 (Office for National Statistics, 2008), consumed 20,000,000 tonnes of Fuel (oil equivalent) and 40,000,000 tones of Oxygen, with atmospheric outputs of 60,000,000 tonnes of carbon dioxide and 400,000 tonnes of sulphur dioxide emissions (Joping and Girarder, 1996, p.10). In the 10 year period between 1996 and 2006, London’s population increased by 8% to 7.56 million (Office for National Statistics, 2008) leading to a probable further intensification of the city’s metabolic rate of fuel and oxygen consumption, and carbon/sulphur dioxide production. Environmentalists argue that the ever increasing amount of atmospheric pollution brought on by population growth, affects the air quality not only of London, but of the entire globe, leading to the degradation of ozone and increased global warming (Rees, 1997). It is therefore not sustainable practice and requires some form of intervention. In line with population growth, urban transport congestion has become increasingly problematic to city sustainability. Depletion of non-renewable fuels used to power cars, and the resultant increases in air pollution presents not only an environmental problem, but also exacerbates the need for a social change in car ownership culture. Currently, levels of personal car ownership within cities statistically parallel economic growth, with road traffic levels paralleling Gross Domestic Product (GDP) fluctuations. In the UK for instance, household car ownership has consistently increased since the 1950s. In 1956, 80% of the UK population did not own a car, whereas in 1994 this figure had fallen to just 30%. Furthermore, travel to usual places of work, whether it be in outer London, a conurbation centre, or other urban area within Great Britain, is disproportionately car orientated, with only Central London having slightly more underground and British rail commuters than car drivers. In concordance, the current infrastructure vastly favours the road traffic user with road systems covering a fifth of urban areas in the UK. This evidentially suggests that a change in car ownership culture would require a huge alteration in city infrastructure (Blowers and Pain, 1999, p.278), or a new set of regulations which curb car usage. Indeed, the London congestion charge has had some effect, although this measure alone does not constitute towards sustainability, as car ownership figures continue to rise steadily alongside economic growth. The third point challenging city sustainability is social in construct, and regards the inequalities which transpire out of economic growth. Howard (1902) perceived cities to be places of unjust and unequal social relations, to which Massey (1999) observes an increasingly insulated lifestyle of the city business communities. Mexico City exemplifies a burgeoning metropolis, with increasing economic investment and opportunities and therefore a growing business community and widening disparity between the rich and poor urban populace. As people move into Mexico City to take advantage of commerce opportunities, they often find themselves unable to afford the high costs of the business elite lifestyle. Subsequently, ‘shanty’ developments have formed on the periphery, where 3 million people (Clark, 1999) lack housing sewage systems, and only 15% of approximately 10 million people claim legal occupancy of the land they inhabit (Gilbert, 1996). As a result, these deprivations together with a lack of access to public amenities and services, reveal an unsustainable future for urban ‘shanty town’ development, and a new form of governance would need implementation to help ameliorate these disorderly consequences of economic progression (Mooney, 1999). Therefore, a form of economic growth through urbanisation which is sustainable, requires the city to retain its ‘ease of communication offered by spatial density’ (Commission of the European Communities, 1990, pp.19–21), whilst not restricting a more orderly urban expansion or limiting worker movements. The city must therefore be compact and intense with a ‘necessary integration between environment, society and governance’ (Howard, 1965 p.42). Indeed, this is not an easy task, with implementation of Howard’s “Garden City” (1902) concept, or Le Corbusier’s “Radiant City” (1922) plans requiring huge structural reformation to take place on top of an already socially and culturally embedded city formation. A Critical Consideration of the Challenges for City Governance with regards to balancing growth together with Sustainable Development. As highlighted in the previous section, city sustainability is challenged by environmental degradation, the established societal conduct, urban monetary disparities, and embedded transport infrastructures which present huge problems for sustainable governance. Indeed, although such problems can easily be plucked from the urban milieu, how does one enact policies which enable economic growth and ‘development that meets the needs of the present without compromising the ability of future generations to meet their own needs’? (World Commission on Environment and Development, 1987). With a focus on environmental policies and arguably the needs of the North, ecological modernization is one approach which attempts to achieve a sustainable future. It suggests that by tapering the processes of production and consumption, it may be possible to reduce resource consumption and pollution to a level which is sustainable. 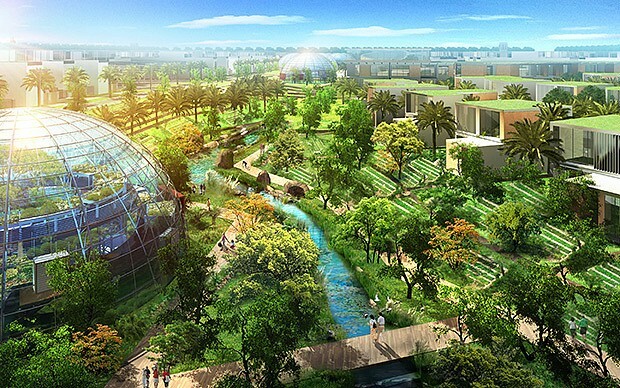 This would involve the lessening of urban traffic and car usage, better waste management and recycling systems and the conservation of green space, thus creating a less polluting and resource efficient city. Alongside this, it is commonly suggested that a market economy will ‘promote the economic growth’ that provides the resources ‘necessary to tackle environmental problems’ (Blowers and Pain, 1999, p.266). However, in a Southern context, as in many cities of Sub-Saharan Africa, these stipulations for sustainable city governance are not entirely applicable with more pressing issues (absolute poverty and chronic hunger) overwhelming these ideas. Indeed, ‘ecologically modernized’ city governance is often a restricted and narrowly western-centric and Northern practice, where the building blocks for democratic rule over a developed urban population are already present (Blowers and Pain, 1999). Rees (1996) notes that if cities of the South were to industrially develop similar to those of the North, and the population stabilised at approximately 10–11 billion in the 21st century, then the planets resources would be deficient by 80%, leading to a rapid ecological decline. Furthermore, the ideas of ‘ecological modernization’, are dependant upon the unsustainable capitalist relations between cities of both the North and South across the globe (Hinchliffe, 1999), and the improvements of the Northern cities may be at the expense of exporting pollution problems elsewhere. If this is the case, then perhaps a more radical governance is required which avoids challenging the existing consumption and pollution problems, and instead initiates a change within the fundamental economic and social relations of the city. To alter the fundamental aspects of the market economy would involve a radical adjustment of structural governance, although Beck (1992) suggests that without a ‘neo-Marxist’ action, environmental catastrophe would ensue. Beck elaborates, stating that eventually there will be a ‘self-destruction of all life on this earth’ due to the high technologies capable of O-zone depletion and nuclear war (Beck, 1995, p.67). However, this radical call for change does not highlight the evidence of improvements within some Northern cities of the world under ecological modernization, although it does suggest that this knowledge may not be transferable to cities of the South, which are still struggling to reap the economic benefits of industrial development (Blowers and Pain, 1999). As Harvey (1996) suggests, the governance of city sustainability will remain a problem within global politics due to different levels of demographic transition across the world’s cities, and a general peripheralization of sustainability concerns. Once these concerns become central to city governance, and when social and economic types of city deprivations are considered equally as important as ecology, then social, environmental, and economic justice may contribute towards a more sustainable future. In support of this, Daly (1991) points out that, ‘economic capital cannot substitute natural and social capital’, because each element is mutually constitutive and each type of capital must be considered equally as important within the functioning of the city. Dyllick and Hockerts (2002, p.133) concur, stating that the economic alteration of consumption and pollution problems, will not alone be sufficient to realize sustainable development, with ‘eco-effectiveness, socio-effectiveness, sufficiency, and eco-equity’ being four criteria that need to be met if sustainable future to be envisenged.. Therefore, plans to create a more sustainable city are challenged by multiform governance issues. The diagram opposite (see Figure 1) illustrates that a balance between several elements within the city’s formation require equal consideration in order to make sustainable progress (Adams, 2006). Indeed, a challenging balance to achieve under a purely ecological modernization, which is noted to possibly downplay the role of social-effectiveness, especially in Southern context, in favour of an environmentally concerned bias (Blowers and Pain, 1999). Hence, any urban planning that attempts to ameliorate the disorders of economic progress, needs to architecturally envisage the relationship between social processes and the physical environment. Ebenezer Howard’s ‘vision of a socially balanced city’ (1902), did this by considering social inequality as a major constraint to sustainability. His Garden City concept presented a ‘rational and orderly method for dealing with complexities’ of different types of urban capital. Despite this, in Howard’s time, land use and resource depletion had not so widely affected cities. Only 14% of the world’s population lived in city spaces then, compared to over 50% towards the close of 2008 (Charbonneau, 2008). One could therefore easily consider the contemporary problems of sustainable city governance as more difficult than one hundred years ago. In conclusion, the only clear answer appears to be that the ‘interdependent and mutually reinforcing pillars’ (UN World Summit, 2005) of social development, economic progress, and environmental protection, are of equal importance (see Figure 1). Furthermore, the traditional concerns with social issues in urban planning, seen throughout Howard’s work (1902), and the contemporary eco-centric concerns of ‘ecological modernization’, have missed one or two key elements required within a balanced city sustainability. Despite the scale of the problem being increasingly recognized, the components of a sustainable city governance appear only partly understood. A ‘sustainable city’ can only be constructed if the processes of urban planning and governance, are able to respond to the differential competing interests that constitute the currently unsustainable spatial relations of cities. This is yet to be fully realized, and perhaps never will be, due to the conceptual utopianism of any urban plan, that articulates a perfect harmony between the widely disperate needs of environmental, economic, and social developments.